Nippon Paint RoofGuard is a high quality and highly durable acrylic-based emulsion that imparts a smooth finish to roof tiles. It contains excellent light-fast and alkali-resistant pigments, and an effective mould-control additive to protect roof tiles.Suitable for application on old and new unglazed roof tiles and other masonry surfaces. 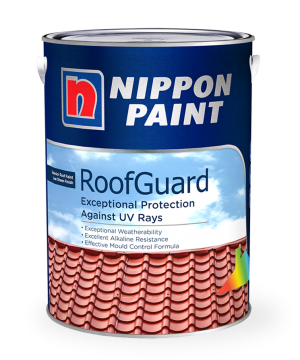 Nippon Paint RoofGuard can be used on old and new unglazed roof tiles, cement-fibre sheets, concrete- or cement-fibre pipes.Not recommended for glazed tiles, unless the glazed film has worn off.